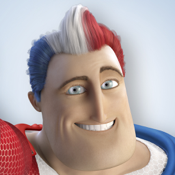 Captain Macleans and the Nurdles show kids a fun way to brush all parts of their teeth correctly. Catchy songs and dances get them brushing and help get them to the 2 minutes of brushing that dentists recommend. And because they’re having so much fun, before they know it, they’re done! Use the tunes in the app or link into your favourite playlists to provide endless dance mix-ups for variety every time they brush.